Here’s an interesting interview on Riptide magazines website with Paulo Barcellos, ex world champion bodyboarder who now makes a living taking photo’s and shooting video of surfing. 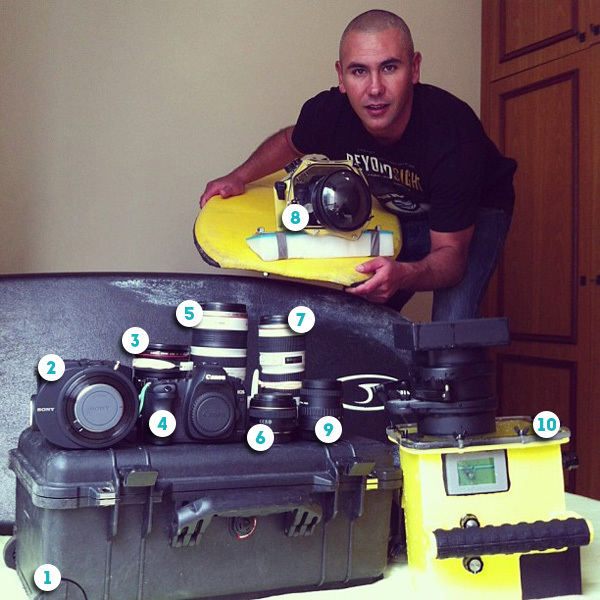 As always I’m fascinated by the photo of all his gear, although in the interview the idea that gear is definitely not everything comes across clearly, experience in heavy, crowded waves and the ability to make the most of your skills has played a much bigger role in Paulo’s success than just having decent gear. It looks like a Peli 1510 wheelie case, I’ve got the same one and at some point in the next 3 weeks I’ll be packing it up for a long trip so I’ll try and document the process and hopefully go into some details on how I sorted out my foam inserts too. Sony FS 700 video camera, this is a professional video camera capable of shooting high speed HD footage or regular speed footage up to 4k resolution, a serious bit of kit. Canon 24-105mm f4 IS L lens, a standard zoom lens, my guess is that he uses this lens and the 70-200mm (number 7) in a housing as you can see the gears attached to the zoom rings on them (this gear mates with one on the zoom control of the port or housing to allow zoom control in the water), it might be for use with the Sony video camera with an adapter, or maybe he’s got another port for the SPL 7D housing.I use a second hand 17-85mm EFS IS lens on my 60D as my budget option standard zoom, it works really well for video. Canon 5D Mark II, it’s been superseded by the 5D Mark III but is still an awesome full frame camera, perhaps he uses this for lifestyle and portrait style shots as the frame rate is not as high as the 7D. Canon 100-400mm f4.5-5.6 L lens, this one seems to be a popular lens for shooting from the beach, it offers a really big range of focal lengths in a relatively small package, and being an L lens it’s great quality too, it’s a bit out of budget for the hobbyist surf photographer. Canon 50mm f1.4 lens, this is one of the most popular lenses for surf photographers, it’s very highly regarded and relatively cheap, because it isn’t an L lens, all of Paulo’s zoom lenses are L’s, reflecting the fact that really good zoom lenses are harder to make and so you have to spend more to get quality. I’ve got the (even cheaper) Canon 50mm f1.8, I haven’t used it too much since I got the 28mm f2.8, so upgrading my 50mm is not on the cards soon. Canon 70-200 f4 lens, I can’t tell if it’s the image stabilised version or not, I’ve got the non IS version and I’m really happy with it for a variety of situations, read my review here. I think that’s the Canon 7D in SPL housing that he talks about in the interview mounted to the board he’s holding, it’s a fisheye lens on there but it’s hard to tell which one. Tokina 10-17mm Fisheye, this is the fisheye that I use, it’s relatively cheap and still great quality for the price, I can’t recommend it enough if you’re shooting in the water. An SPL housing for the Sony FS 700 video camera. Be sure to click through to the interview, it’s a good read if you’re into bodyboarding and there’s some inspirational tips on getting into professional surf photography too.